Aaron was very knowledgeable about San Miguel's rich history including the local area around San Miguel de Allende. During the tour we were able to see cultural and historical highlights as well as break for helado y chocolate...thanks Aaron!! TOUR GUIDE RESPONSE: Thank you Rebecca! I'm glad you liked the tour, and the chocolates as well! Aaron was an excellent guide for a casual tour of San Miguel de Allende. He was very personable, knowledgeable and informative. TOUR GUIDE RESPONSE: Thank you Rob! Aarón has a very impressive command of Mexican history. He patiently answered all my questions and helped me gain a much better understanding of the history and culture of Mexico. His English is excellent. I highly recommend his services. TOUR GUIDE RESPONSE: Thank you Kent! Aáron was an excellent guide, full of history, culture, architecture and art. He had a lovely sense of humor and was very flexible, which we appreciated. We highly recommend him! TOUR GUIDE RESPONSE: Thenk you very much Hillary! We had a great day trip/tour with Aaron. We enjoyed the towns visited, the winery and cheese factory, and the drive to and from San Miguel. Aaron provided a great blend of letting us wander when we wanted and sharing his expertise about the area, answering any questions we had. Would definitely recommend. TOUR GUIDE RESPONSE: Polly, I'm glad you enjoyed the tour. Thank you! Wonderful four days. Guanajuato, Querétaro, Dolores Hildago, and San Miguel Allende. Might recommend adding a Day because there are so many things to see. This is a beautiful part of Mexico with colonial towns that had gorgeous plazas, incredible churches, and the friendliest people on earth. Great shopping, particularly in SMA, which we used as our base. TOUR GUIDE RESPONSE: Thank you Jack for your comments and rating! Excellent tour guide, informative and very safe. Highly recommend this tour and the guide. TOUR GUIDE RESPONSE: Thank you Ralph! Aaron is a fantastic tour guide. He's personable, professional and very knowledgeable! TOUR GUIDE RESPONSE: Thank you very much Michelle! Aaron was a wonderful tour guide. He was friendly, knowledgeable, & a good driver with a nice car. We couldn't have navigated the language, finding food, bathrooms and generally feeling safe, without him. We enjoyed both butterfly sanctuaries immensely. We are very grateful that he made our adventure so memorable! TOUR GUIDE RESPONSE: Thank you very much Dona! This was a very enjoyable trip. Aaron. We booked a Walking Tour of San Miguel de Allende with Aaron as our tour guide. Aaron was extremely knowledgeable about SMA, and had many historical & cultural stories to share. We walked all over the Centro area of town, spent as much time as we wanted in areas of interest, and really enjoyed ourselves. He was flexible in our specific requests, such as stopping for ATMs or a cup of coffee. He gave us good insight on places to go on our own. His overall personality made our tour wonderful. Gracias! TOUR GUIDE RESPONSE: Thank you very much for your comments Nancy! I also enjoyed my time with you. Aaron was a very knowledgeable and interesting guide. He was very prompt picking us up and covered all the main places of interest with interesting commentary. We would gladly recommend him. TOUR GUIDE RESPONSE: Thank you Andrea! Nice walk to downtown. Aarón is a fantastic tour guide. My friend and I had a marvelous trip from San Miguel de Allende to Rosario Monarch Reserve. Aarón was very communicative about tour prior to departure, timely, knowledgeable about locations we drove by on the way to the reserve as well as all aspects of the monarchs. A tour to Rosario with Aarón is an opportunity not to be missed. TOUR GUIDE RESPONSE: Thank you very much for your comments Suzanne! Another great tour by Aaron, our fourth tour in as many years. Aaron is personable, extremely knowledgeable and flexible. His English is perfect. We enjoyed our walking tour with him. We recommend him very highly. TOUR GUIDE RESPONSE: It was nice to see you again! Thank you James! TOUR GUIDE RESPONSE: Thank you Susan and Rob! Aaron was a great guide to the Monarch Butterfly Reserve. He is patient, professional, personable, and speaks fluent English. We thoroughly enjoyed our time in nature watching the magic of the butterflies! And the horse ride up was fun too! It was a manageable day trip because we could sleep or check out the scenery on the way home. We had 5 in our party and the van was super comfortable and roomy. Aaron also made halfway stops to stretch, grab a snack, etc. Thanks, Aaron, for the great day! TOUR GUIDE RESPONSE: Thank you Marcy! I'm glad you enjoyed the day. Aaron was an exceptional driver. His expertise on the sites we visited were most appreciated. Would recommend his services when visiting San Miguel or Guanajuato. TOUR GUIDE RESPONSE: I'm glad you liked it. Thank you Howard! Our tour of Queretaro was great. The historic center of Queretaro is very interesting , with many beautiful buildings and tree lined plazas. The city has a long and rich history. Aaron was very informative. TOUR GUIDE RESPONSE: It was good to see you again Mark! Thank you! The Tour of the Canada de la Virgin was wonderful, interesting and more than expected, but the choice of the Lunch location and the uniqueness of the Lunch made the day very special. TOUR GUIDE RESPONSE: Thank you Ron! It was a good day. This is an amazing trip and we were very lucky that the weather was perfect. If you weren't as lucky as we were, it would be an awfully long day in the car with nothing much to see as the drive is 3+ hours each way. 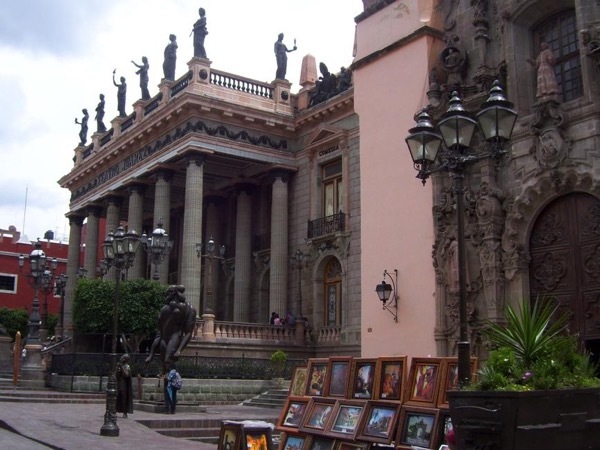 We were staying in Guanajuato and wanted to visit points of interest outside this city. Aaron had several options on his site, and worked with me, via email, to develop a custom tour. He responded promptly, and had great suggestions. We coordinated a tour that was just what we wanted. Aaron is an experienced professional, knowledgeable and open to questions about all aspects of Mexican life. His English is excellent and he will help with Spanish with a kind spirit. TOUR GUIDE RESPONSE: Thank you Susan! Aaron was very professional, knowledgeable and enjoyable. We would highly recommend him. TOUR GUIDE RESPONSE: Thank you Denise! Aaron is a knowledgeable guide, both of local highlights and history. He is open to questions and is flexible in customizing your tour. He is able to make suggestions for restaurants and shopping as well as cultural places not covered by the tour. His English is excellent, but if you want to practice your Spanish he is a kind and patient teacher. TOUR GUIDE RESPONSE: Thank you for your comments Susan! I really enjoyed my time with the four of you and also the "Spanish lesson". TOUR GUIDE RESPONSE: Thank you Karen for your comments and rating! Aaron was a terrific guide. His knowledge of the history of San Miguel is superb. He made our 3 hour walking tour special. TOUR GUIDE RESPONSE: Thank you May! Excellent tour guide. Perfect English kind and thoughtful very knowledgeable about the history of the area and flexible as to what you want to see. Highly recommend. TOUR GUIDE RESPONSE: Thank you very much Lola for your comments and rating! Aaron is the perfect tour guide, both as a professional and as a person. His knowledge of national and regional Mexican history, culture and art is incredibly impressive, and he shares it without overwhelming you with it. He read our moods and preferences perfectly, and had the flexibility to adjust accordingly. We learned a lot from him, but more importantly, we greatly enjoyed spending time with him. Highest recommendation. Aaron was a wonderful guide and a great driver. We loved seeing the countryside and enjoyed all of our stops. I recommend using Aaron for the wine and cheese tour. I had such a fantastic time visiting San Miguel de Allende with Aaron. His historical and cultural knowledge makes sightseeing so much more interesting. I very much appreciated that he was able to make suggestions based on my comments/questions and tailored my tour accordingly. I feel like we did a lot in one day and there is not one thing I would have done differently! TOUR GUIDE RESPONSE: Thank you very much for your comments Christine! I really appreciate it and also enjoyed the day. Aaron was a great guide. I know QRO well but had a visiting friend who had never been here before and wanted her to have an overview of the city. It was perfect and I even learned and saw a some things I had not known about before. The pace of the tour was well done with places along the way where we could sit and learn more about the history of Queretaro and Mexico. I would highly recommend the tour to anyone. Thanks Aaron for a great day! TOUR GUIDE RESPONSE: Thank you Linda for your comments! I also enjoy the tour with you and Ann. Enjoyed our tour around the historic center of Guanajuato City. Our guide walked at a comfortable pace and made sure we were seeing the things we wanted to see. We asked many questions and they were answered. Our tour of Guanajuato was amazing! I wanted my family to learn some history of central Mexico and Aaron's knowledge of the area made this experience very memorable for all of us. Aaron's recommendations of places to see could have not been more perfect for our group. We highly recommend Aaron to anyone interested in visiting the area. TOUR GUIDE RESPONSE: Hi Malena! Thank you for your comments! Greetings to your lovely family. This was our first tour like this. Just found it on the web, had a question and it was answered immediately. This type of service was the reason for our booking. Aaron was right on time and our whole day was very relaxing and informative. We did have one special request and this was worked into the tour very easily. The manner in which Aaron presented his knowledge of the area was relaxed and easy to assimilate. Our trip was very enjoyable and we would certainly use Toursbylocals again & use Aaron! Aaron gave our family a wonderful walking tour of historic Santiago de Queretaro. We range in age from 4 to 84, and our guide was attentive to each of our individual needs and interests. He was punctual and kept the tour on pace without feeling rushed. There was a couple of unadvertised stops that showed off some beautiful architecture and color which make Mexico so special. Additionally, Aaron's English was extensive and perfect, which for us was key since only two of us speak Spanish. TOUR GUIDE RESPONSE: Thank you so much Sarah! I really enjoyed my time with you. We toured with Aaron in both Guanajuato - Dolores-Hidalgo and then in San Miguel Allende. Two days of private tours. Two distinctly different, terrific and memorable days. Aaron was most knowledgeable, accommodating and gracious. He was able to adjust our tour and build around it in order to check off our additional wishlist items - such as stopping at the Gallery of Atotonilco, as well as the shrine. In short - thanks to Aaron, our trip was wonderful and we highly recommend his services! Fabulous guide! Aaron has a vast knowledge of the history and culture of the area and Mexico in general and presented it to use in a fascinating manner. He is charming, courteous, patient, and completely fluent in English. Could not have been better. TOUR GUIDE RESPONSE: Thank you Francesca for your comments and rating! It was a pleasure to meet you and guide you. Aaron is personable, reliable and extremely knowledgeable about Mexican history and culture. Our group use him on four separate occasions in one week, and we highly recommend his guiding services. TOUR GUIDE RESPONSE: Thanks for all the recommendations with your group. It was really nice to meet you. Aaron is very knowledgeable about Mexico's history and did a wonderful job of bringing it alive for us as he introduced us to Queretaro's amazing array of beautifully maintained historical structures, both religious and civic. Our group thoroughly enjoyed Aaron's tour. Wonderful tour. Aarón was very knowledgeable of the city and it's culture. I would most certainly take another tour with ToursbyLocals the next time I'm in the area. Thank you again Aarón! Aaron Trejo was a spectacular tour guide with untold knowledge of not only San Miguel de Allende but also Mexico in general. His English is perfect and he has a very friendly disposition. My wife and I highly recommend Aaron. We had a great tour. Aaron is extremely competent. Knowledgeable, helpful and flexible. We hope to see him again!! TOUR GUIDE RESPONSE: Thank you for your comments Ivan! Greetings to you and your lovely family. Aaron. Aarón is an excellent tour guide. He not only knows the history of the city but also knows the history of the church. He is nice and patience. He also can help us make connection with Guanajuato and Mexico. This was an excellent excursion with Aaron. We drove from San Miguel to the Sanctuary. The time went by quickly as Aaron filled the time with history of the region, commentary and pertinent information. Once we were there, it was clear that Aaron is passionate about the butterfly sanctuary (and Guanajuato in general). The interaction with the monarchs was astounding and something we'll never forget. Recommendation: Take the horses! We'll certainly contact Aaron next time for the Queretaro tour. Aaron was an excellent guide who was very knowledgeable on the history as well as modern culture of San Miguel de Allende. I highly recommend him. I have a lung condition but Aaron stayed with me the whole way. I sent him ahead in the last 100 yards and I eventually met everyone at the observation site. My wife and I cannot thank Aaron enough for the patience he showed me on the climb. He was a great guide and was one of the best tours we've had in a long time. Seeing the thousands of butterflies was a whole different experience for all of us. absolutely worth the trip-we used the horses going up and down the mountain. Great trip - very punctual pick-up right at our accommodation, clean comfortable van, and a friendly, patient and knowledgeable guide. And the butterflies are awesome! My recent tour w Aaron Trejo to Guanajuato last Monday was excellent. A rating of 5 out of 5 without a doubt! He was able to focus and educate me on several topics in Guanajuato. I learned a ton and enjoyed everything we did. The mummies being my favorite! I wholeheartedly recommend Aaron for all your touring needs in San Miguel, Guanajuato!! Many thanks for such a memorable experience! Aaron was great - knowledgeable, friendly and accommodating. What a great tour ! San Miguel de Allende is such a beautiful city and Aaron made it so enjoyable. He was professional, knowledgeable and friendly. I strongly recommend this tour. Great day with Aarón. Very affable and informative guide. Very accommodating of our particular interests. Aaron arrived promptly at 8:00 am in his spotlessly clean car. His English language and manners were lovely right from the start. He is well-educated, knowledgeable and professional at the same time as he is friendly and relaxed. We loved his interactions with the local people, especially the children. He's an excellent ambassador for the people and culture of Mexico. Aaron was fantastic. We threw him a curve ball and asked for some customizations with little notice, and he totally pulled through with an impressive tour filled with culture, food and fun. More so, he was able to keep the attention of everyone in our family, including two little kids. Highly recommended. Aaron was very personable and knowledgeable. He provided a nice car to ride in, was a safe driver, had a grasp of everything one would expect and more. No questions we asked went unanswered. We would definitely recommend Aaron. Prompt, professional, knowledgeable, and friendly. Aaron surpassed all expectations. In such a beautiful city as San Miguel, couldn't imagine not touring the area and learning about it's history. So thrilled we got this opportunity. We thoroughly enjoyed our day with the pleasant, very professional and informative Aaron. What a pleasure exploring Guanajuato with him and the ride there from San Miguel de Allende was relaxing and beautiful. We stopped at an amazing ceramic "factory" but it was really an artist studio with gorgeous, high quality pieces. A great day!!! Excellent driver and company on our 8 day trip trough Mexico, Aaron takes care of you and is very helpfull, we highly recommend him for short or long tours. Thanks Aaron! Aaron was charming, extremely knowledgeable and my tour guests and I thoroughly enjoyed our time with him. He escorted us for three days around San Miguel de Allende, Guanuato and then on to the Pyramids and kindly dropping us at our hotel in Mexico City. We couldn't have wished for a better tour guide and wouldn't hesitate to recommend him and to book him again next time we visit San Miguel de Allende. We really enjoyed our tour of Guanajuato with Aarón. We felt like he was able to give us a lot of history and stories about the places that we visited that we otherwise would not have known. In Guanajuato it was not especially easy to find a tour guide that speaks English, so that was also a big plus for us. The trip was amazing and Aaron is a very good guide and a nice person. Recommend 100% to everyone. Aarón is very professional, well-trained, knowledgeable, respectful and punctual. I strongly recommend him. Aaron was on time for our appointment (always a good thing) and polite throughout the 3-hour walking tour of Queretaro. His deep knowledge of the cultural and political history of Mexico and Queretaro emerged during all of the stops we made. Through his eyes and explanations, I discovered and appreciated details that just cannot be obtained from a guidebook. A deep and memorable dive into the city's past. Aaron was personable, knowledgeable and enjoyable as a person. I learned a lot, saw a lot and had a wonderful lunch in a grotto restaurant that made the afternoon complete. I highly recommend him. This was our second tour with Aarón and it was just as wonderful! We truly enjoyed spending the day with him exploring towns in Querétaro, an old hacienda and the botanical garden. His knowledge and expertise made these "Pueblos Mágicos" even more special. Aarón has an obvious passion for introducing visitors to his very beautiful city, Santiago de Querétaro. His walking tour of Querétaro is perfectly organized for tourists to learn the most about this historically significant city. He is very caring and accommodating and answered our many questions in detail. We could not have asked for a better guide. Thanks you Aaron for the well-guided trip. Shared a lot of historical information and was flexible with my preferences. I recommended you to my colleagues. Aaron is a knowledgeable, personable, adaptable and caring guide. We spent four days in three cities in Central Mexico. He new the history thoroughly and was able to make it interesting.He answered all of our questions. I recommend him highly as a guide in Central Mexico. Aaron was a wonderful guide, showing us so many aspects of both San Miguel de Allende and Dolores Hidalgo. We learned a lot of history, and good places to walk and eat. A very enjoyable day. This was a fabulous tour experience and Aaron was a terrific guide! He was prompt, friendly and an excellent driver. En route to the butterfly sanctuary, he shared his in-depth knowledge of Pre-Hispanic and Colonial history in an informative and entertaining way. After the butterflies, we ate lunch in a Pueblo Magico--a fitting end to a magical day! Thanks, Aaron! We thoroughly enjoyed our tour with Aaron. Guanajuato is a great city and he showed us all of the highlights. It was our first day at that elevation and he was super understanding when I needed to move slowly and the occasional stop. I highly recommend him for your Guanajuato tour. Aaron was terrific! His English is outstanding and we accommodated the 4 of us to a wonderful tour to see the Monarch butterflies. The only thing that would have improved our adventure would be a little larger vehicle as the car was tight for 5 of us (including him) He is an outstanding driver which is important for the long ride we had from SMA. I highly recommend him. He even helped us buy the "exact kind of water we wanted" when we got back to town. TOUR GUIDE RESPONSE: Hi Amelia. Thank you very much for your rating and comments! I'm glad you all enjoyed the tour! Regarding the car it was a Mazda 6, which is a big sedan. I understand that for this long ride it can be a bit tight for 5 people (including me). Another option would be using a Minivan, which is possible, with an extra cost. Greetings to all of you. Aaron. Aaron is a very knowledgable, intelligent, and amiable guide who customized a tour for us. We have worked with him several times in the San Miguel and Queretaro areas and have always enjoyed his tours. We highly recommend. Aaron was a really good tour guide. We were a group of six with different capabilities and interests. He was very accommodating. Aaron put together a trip for myself and three friends to the Sierra Gorda in Feb 2017. We were all delighted with the trip. He is very knowledgeable and was flexible in accommodating our needs and interests. He provided a comfortable car and handled the large amount of driving. I would not hesitate to recommend him. Aaron was an excellent guide. Knowledgeable of the tour environment. He was not overbearing with information on our 3 hour drive, but made sure to point out important sites. His English and Spanish were excellent. He was kind and professional. I would recommend him for anyone wanting to take a tour. The trip to the monarch butterfly sanctuary was on my bucket list and it was AWESOME. I highly recommend this experience. Aaron made it even better by making sure we got good horses for the ride up and a great meal for when we came down. He also went out of his way to take us to a wonderful ceramic store. The drive was long and Aaron is a great driver and answered the numerous questions we had about sights we saw along the way. Magnifico! Our guide Aaron was a delightful wealth of information. Recommend without hesitation. Thanks to Aaron we have a deep appreciation for the beauty and importance of this terrific city. Aaron suggested a fabulous place for breakfast on the way and a truly magnificent place for lunch. He answered all of our questions thoughtfully and completely. Looking forward to our next tour with him to see the Monarch butterflies tomorrow ! Flexible, willing to bend schedule to meet your needs, and knowledgable about all things San Miguel. Aaron is an excellent guide. He was knowledgable, responsive and flexible to our needs. It was a perfect excursion. Hilary and Raphael Kahn, Sydney, Australia. Could not have asked for a better tour guide. Aaron was friendly and very knowledgeable of the historical importance of the sights we visited, and of the Spanish and indigenous cultures. Would recommend Aaron and this tour to anyone who wants to have a great introduction to the city of Queretaro. My day tour with Aaron in Guanajuato yesterday was excellent! Aaron was on time, courteous and very knowledgable. He is a very good guide. He paced the tour well and I saw everything on my list. Aaron is a good driver and a very polite man. He explained things very well and was a lovely lunch companion. You have an excellent business and I have enjoyed using your services and will continue to do so. Aaron made our experience wonderful! We truly enjoyed the tour. Aaron's demeanor and his recommendations were excellent! Aaron is an extraordinary guide. He is extremely knowledgeable, very professional and a super nice guy! Also, he tailored the tour to us. Aarón was an excellent, knowledgable guide, and a terrific companion for our two days with him in the Sierra Gorda. He suggested numerous beautiful places to visit we had never heard of, we ate at wonderful restaurants at villages in the mountains, hiked on some spectacular trails, and we learned a lot both about the rich 17th to 19th century legacy of the region as well as about the present. TOUR GUIDE RESPONSE: Lawrence, thank you very much for your comments. I'm glad you enjoyed the trip. Regards! Aaron knew the area very well and my husband and I wouldn't hesitate to use him again or recommend him to anyone considering a tour. Aaron is personable and it was a joy and highlight of our trip to have him as our tour guide. TOUR GUIDE RESPONSE: Thanks for your rating and comments Catherine! I'll see you in Guanajuato. This is the second tour with Aaron and it was great. I would and have recommended him as a tour guide. We had our 13 and 3 year old granddaughters with us and he made the day interesting and informative.